Amazon Price: $149.99 $139.99 You save: $10.00 (7%). (as of January 23, 2019 11:03 pm - Details). Product prices and availability are accurate as of the date/time indicated and are subject to change. Any price and availability information displayed on the Amazon site at the time of purchase will apply to the purchase of this product. 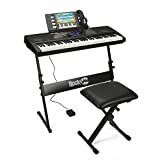 The Rockjam 761 Super Kit includes a 61 key full size keyboard with sturdy adjustable stand, a comfortable and durable stool for use in the home, on stage or in the studio, a pair of high quality headphones and a sustain pedal. The keyboard is both practical and adaptable, with 50 demo songs, 100 sounds and 100 rhythms and gives easy access to on-board practice and teaching functions. The effect and control modes and accompaniment control modes allow you to add even more features to your music. A perfect all in one package for beginners, entertainers and musical educators alike. 50 Demo Songs/Record & Playback Feature Choose from 50 different demo songs to help you get used to creating your own music. Record and play back your playing easily with the record setting. The maximum recording capacity is 40 notes and the easy to read LCD display lets you know once capacity has been reached by displaying FL. 100 Sounds & Rhythms To Experiment With Featuring 100 keyboard sounds and 100 rhythms to experiment with all of which are easy to access on a clearly labelled control panel with rubber buttons and an LCD display giving you full keyboard functionality. The Rock Jam 761 is the perfect answer for any beginner looking to purchase their first keyboard. Choose from a variety of sounds – including piano to piccolo, organ, and many other orchestral instruments. Effect And Control And Accompaniment Control The Rock Jam 761 keyboard also has 3 different effects and controls helping you add more style and really fill the sound of your music. You can also play chords from a single key and learn and understand how chords are constructed. Easy To Use On-Board Practice / Teaching Functions The on-board practice / teaching functions help you to fill your sound and play along with the main melody. With the rhythm programming function, you can construct a backing to your pieces that will help further inspire you.